Because of this, only the truly fastidious car owner endeavours to keep the endless road grime at bay. However judging from the current state of this particular vehicle it has witnessed neither sponge nor chamois for some considerable time. But what makes this down at heel example all the more interesting to me is the fact that it isn’t some throwaway econo-hatchback, but a large, (at one time) expensive, ergo valuable luxury car – one I might add which remains in daily use. Mercedes C219 CLS was never a particularly common sight in this part of the World – the standard E-Class saloon being the preferred choice for those who elected to display their monetary successes – a tradition which arguably dates back to the E-Class’ W123 predecessor, which was employed as official government transport here throughout the 1980s and ’90s. Irish luxury car buyers for the most part, are traditionalists, so when it comes to the three pointed star they have a broad tendency to shun the more decadent coupé models – certainly outside of Dublin’s fleshpots at least. Furthermore, while in the UK market, the horizontal Sport grille treatment has become the default (indeed the only choice in many cases), Irish Mercedes-Benz customers routinely cleave to the traditional upright grille complete with bonnet ornament – by a factor (by my not empirically accurate reckoning), of about three to one. I digress. This particular Mercedes CLS is a regular sight round these parts. Clearly the owner is a busy man – one with neither the time, nor the inclination to do much towards looking after the visual wellbeing of what was once a desirable motor car and one which continues to be (one imagines) an commensurately expensive one to run. Distinguishing it further however is the fact that not a single panel doesn’t bear some scar, scrape, abrasion or missing component. A thirteen year-old example, it’s probably in reasonable enough mechanical fettle and assuming it’s serviced regularly, should keep going for a few years yet, but one has to wonder how many bodily adulterations it took before the owner determined that matters had progressed too far to fret over? Of course the irony is that in this neck of the woods, an off the shelf equivalent would now set you back in the region of (or over) €100,000. Given the potential outlay of any putative replacement, the owner of this well-used example really is best advised to run the car he has into the ground – a rationale he does rather appear to have embraced with gusto. One of the many joys of this site is the occasional (regular, in the case of R. Herriott Esq) cerebral challenge such as Yeates opening a discourse on car care. But your man with a CLS is not a new phenomenon; 40 years ago there was a similarly successful (if not universally respected) Derbyshire business owner who bought (probably cash) himself a new Rolls Royce Silver Shadow which he never washed and which was used as a company hack. Some years on and it was rumoured that RR tried to buy it back from him to remove such a disgrace to their image from public view. As cars can now be built to last almost indefinitely, it is necessary for manufacturers to programme them to perform with reliability up to a pre-determined total-fail point. For how else can the industry have a future? And so, why should an owner waste time on appearances? Your man is to be commended for his perspicacity. I, on the other hand, will arise and go now, for I have a Jowett to fettle. Now, that’s a car you would never want to park next to in a supermarket car park! I agree that it has a certain post-apocalyptic “Mad Max” appeal, enhanced by the slightly sinister look of the original CLS. Given its condition, I guess it’s worth precisely nothing as a trade-in, as the cost of repairs to make it respectable would be completely unviable. Hence, he might as well drive it into the ground, or at least to the scrap yard. The Gardaí will be having a word about that tail light. I prefer the “natural patination commensurate with age” of Eóin’s example. One of the advantages of freeze/thaw cycles that we in Nova Scotia have been subjected to this past decade of climate change is that it snows, covers a car, then melts off, carrying the accumulated detritus of daily life with it. Rather than three months of continuous below zero Celsius temperatures as in the past, which turned all cars into white ghosts of road salt encrustation for weeks at a time, we can have clean cars for a day or two until the cycle repeats, some 15 times already this season. For lazy old folk like myself, this has been a boon, obviating the need for trips to the car wash. Lest one think these are mild freeze/thaw cycles, it is accompanied by wild temperature swings. Yesterday it was 9C with rain. Tonight it will be -8C. The forecast is for a bit of snow, and a return to 5C for Friday followed by -11 for Saturday night. We are south of Ireland by quite an amount – I’m at 45 degress latitude, but otherwise face each other across the Atlantic Ocean. Unfortunately we get fed warm weather systems from Florida on the one hand, and the extreme cold ones from the vast continent on the other. Thus the wildly swinging weather of late, whereas continental weather used to dominate in winter. We do have corrosion problems because of the swings, and road surfaces are completely ruined by it when water freezes in cracks. You need rugged suspension in Nova Scotia and fat tyres. Mazda claims to have a corrosion monitoring station here in their car brochures, but it must be hidden from public view. A glance at decade-old 3’s should be all one needs to see to realize that their paint coheres in sheets better than the sheet metal Mazda used. Paint holds many old Mazda fenders/wings in generally recognizable shapes. They claim to have bucked-up corrosion protection since 2010. We shall see. There’s your niche general knowledge for today. As for this sorry example of an old CLS, I remember one middle ’70s 450SE around here which deteriorated to the point where the sills were completely rusted off. Somehow it passed the inspection each year, goodness knows how. At least the mild weather Ireland receives, whether stormy or not, prevents rot as I know it, but dear me, that CLS bumper and scars are a bit much. Couldn’t stand that myself and would have to have it repaired. Some people! Nova Scotia has its own challenges; Ireland´s are such as to ruin cars quite quickly, especially in rural areas. Dents are a small scale problem; the terrible roads are another. It´s not that they have holes so much as they are really, really uneven. Local councils use aggressive speed bumps more akin to low walls. No speed is comfortable to traverse them. Then there is the damp and wet climate. 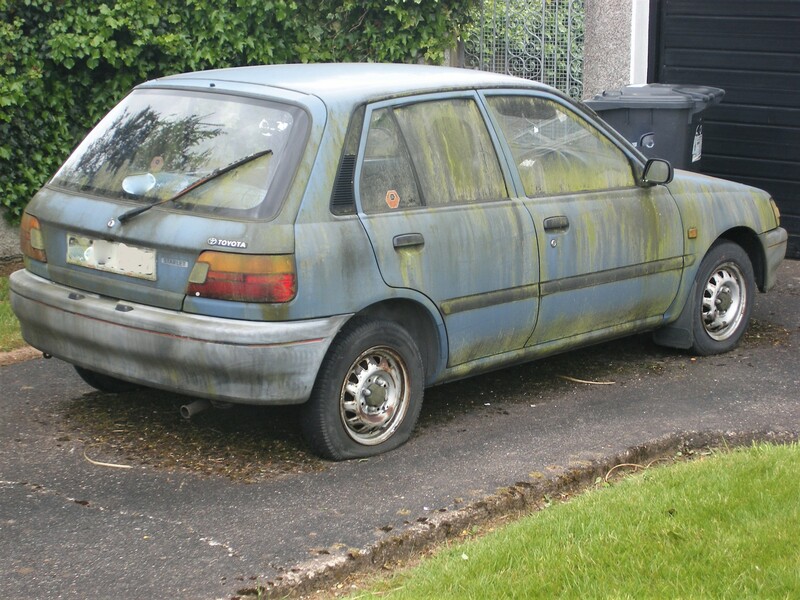 One of the main features of my childhood environment was lots and lots of rotting cars. Cold damp climates like Ireland and the UK are still corrosion machines, even without the snow and the deicers. the air temperature is 3 degrees C and the dew point is 2 degrees. The temperature of a steel object (like a car) will lag the increase in air temperature by several hours. (the body panels of the car takes several hours to warm up, and to cool down). So the car panels are still at overnight temperatures, below the dew point, and water is condensing on every steel panel surface, on the outside of the car, and also inside all the closed sections, like the sills. If it is constantly wet, even galvanized steel will eventually rust. When the sills of the car rust from the inside out, this is how. Excellent piece and one that really does focus on the minutiae and odd eccentricities of those interested in the motor car. 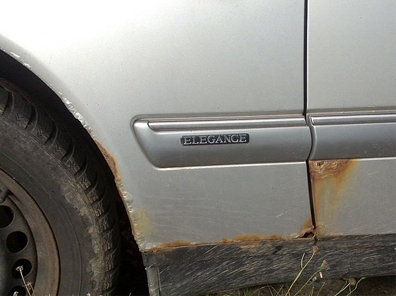 Personally preferring a clean car, the patina, lived-in, rat-look, call it what you will does hold an appeal. There’s a certain beauty in decay and this example “shines” to perfection. Used, abused but valiantly wades into battle each day; and what battles this bus has seen! On seeing this bruised CLS, a blues style song from the cars perspective entered my head. As for the “faked” rat look, again, appealing. Not sure that I could do it my car (what would the neighbours say?) but visual impact with its park a mile away stance, give it a wide berth on the highway, cor blimey guv’nor – look at it – Yeah, loving it. So, altogether now, Woke up this morning, decided to give my decent lookin’ coupe a makeover…maybe not. I have no pictures but in our nations “big freeze ” last week, at minus 6, a black Jag XK parked up and covered in frost had the look of Tolkien map on its flanks. I thought that beautiful. Frankly Daniel, the sooner those monstrosities crumble back into the earth, the more contented I shall be. There’s nothing more kitsch than a clean, immaculate 4×4 vehicle. a pampered & valeted off-road / 4×4 vehicle. Liberal quantities of mud is to an off-roader what the colour/trim/wheels triangle is to an on-road vehicle. Crucial, more often than not. the above in the process. of driving a hitchhiker that extra hundred miles home. Nor can it be bought with the ashes of million-dollar deeds. My word, that’s car neglect descended to stalactite level! But I say again, it does lend an aesthetic appeal to me. “From the Land of the Rotting Sun” a study in the weathers role of decay.